The cell. 3. Cell membrane. Cell junctions. Atlas of plant and animal histology. Cells adhere to other cells and to the extracellular matrix by means of adhesion transmembrane proteins. Integrins, cadherins, selectins and immunoglobulins stand out. Sometimes many adhesion proteins join together , and to other proteins, to form large macromolecular adhesion complexes, generally known as cell junctions. These molecular scaffolds are essential to keep the integrity of many tissues, such as epithelial, muscular, and nervous tissues. Cell junctions are classified regarding their morphology, the type of adhesion molecules they contain, the structures they adhere to, and their interactions with the cytoskeleton. Cell junctions were first observed with electron microscopes and were named according to their morphology, but it was the molecular biology techniques that uncover their complex molecular organization. Tight junctions (Figure 1), also known as zonula occludens, are found in the more apical part of the epithelial cells, in cardiac muscle, in the edotheium of the central nervous system, and hepatocytes. They make so strong and tight contacts between adjoining cells that the intercellular space is nearly occluded. Figure 1. Organization of epithelial tight junctions in the intestine. This molecular organization is similar in other epithelia, as well as in the cardiac muscle (modified from Niessen, 2007). In the epithelial cells, tight junction work as a zipper around the cell perimeter. Apart from the strong adhesion, tight junctions carry out other functions. For example, in the intestine epithelium, tight junctions do not allow molecules diffusing through the intercellular space between enterocytes, and are forced to cross through the enterocyte, a much more selective pathway. Furthermore, tight junctions maintain the epithelial cell polarity because they form a physical barrier, so that they prevent the lateral diffusion of membrane molecules, both proteins and lipids. It is a physical barrier for lateral diffusion in the plasma membrane. Thus, an apical plasma membrane domain with a particular set molecules is established, different from the latero-basal domain. This is essential to properly direct molecules from the intestine lumen to the blood vessels: enter the enterocyte through the apical domain and exit through the basolateral domain. Tight junctions are composed of more than 40 types of proteins. Transmembrane proteins are the claudins, a family of proteins known as ocludins, and the JAM proteins (junctional adhesion molecules). Claudins are transmembrane proteins in charge of making the cell-cell adhesion, and between the adhesion points there is a very narrow extracellular space (around 1 nm) that lets ions to travel between the cells. There are twenty types of claudins forming passages with different sizes. Cells may change the expression of claudin types, thus being able to regulate the permeability through the intercellular space. Ocludins are not really necessary for tight junctions, but they provide stability to the cell junction and help to make better barrier. JAM proteins establish intercellular connections, but they appear to be more important in stabilizing the macromolecular scaffold. The intracellular domain of these proteins is associated with other molecules known as ZO (zonula occludens), which in turn are connected to actin filaments and other cytosolic proteins. Depending on the adhesion state of the cell, these intracellular molecular interactions may trigger signaling pathways that affect the cell physiology. An interesting observation is that the occurence of tight junction in cells may need the presence of adherent junctions. Adherens junctions (zonula adherens) are cell junctions between epithelial cells. They are found in the apical part of the cell, just below tight junctions. During development, adherens junctions are the first cell junction to appear in epithelia, before than tight junctions. They are thought to be involved in morphogenetic processes. Like tight junctions, adherens junctions form a belt-like structure all around the cell. The extracellular domains of E-Cadherins and nectins are involved in the cell-cell contacts, whereas their intracellular domains are linked to several molecules like β- y α-catenins, catenin p120 and afadin. These proteins are intermediaries between adhesion molecules and actin filaments. Furthermore, β-catenin may enter the nucleus and change gene expresion. Adherens junctions are sequentally assembled. First, junctions mediated by nectins are established, which form rather weak adhesions, and then cadherins are recruited to form stronger and more stable contacts between cells. In some cellular types, adherens junctions initiate the formation of tight junctions. 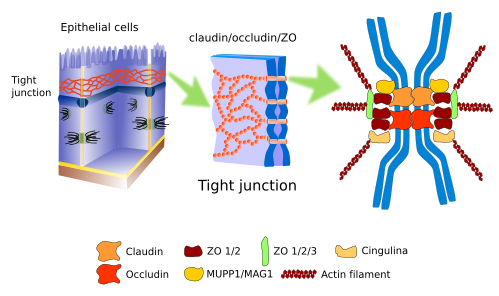 Occludins, together with their proteins scaffold, are first recruited by the adherens junctions, and ZO proteins may have a relevant role in this process. Tight junctions, adherens junctions and desmosomes are needed for the integrity of the epithelial layer. But only the adherent junctions are needed for the coordinated movements of groups of epithelial cells through the epithelial layer, which is a relatively frequent movement. The cell-cell adhesions made by adherent junctions build a connected net of actin filament bundles from different cells that join together a cell population. These connected cells behave coordinately, for example, to cover a wounded region. Desmosomes (macula adherens) make spot-like cell-cell adhesions, like rivets (Figure 2). They are very abundant in epithelial and muscle tissues, but can also be found in virtually every tissue, for example in the nervous tissue. 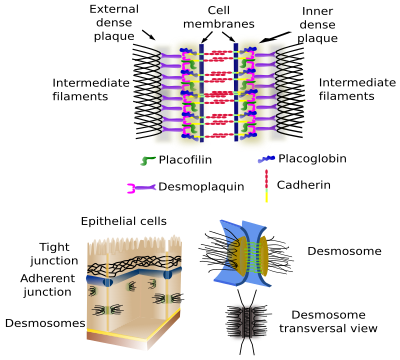 Cadherins (desmoglein and desmocollin) are the adhesion proteins in desmosomes. The intracellular domains of desmosome cadherins are associated to intermediate filaments through intermediary proteins. Figure 2. Organization and composition of desmosomes (modified from Huber, 2003). 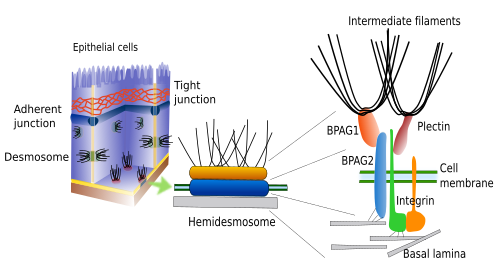 Hemidesmosomes and focal adhesions make adhesion contacts between cells and the extracellular matrix (Figure 3). Both contain integrins as the adhesion molecule. Hemidesmosomes are junctions between epitelial cells and the basal lamina (a type of extracellular matrix). Intracellularly, the cystolic domain of these integrins are associated to intermediate filaments. Although hemidesmosomes look like one half of a desmosome, they are compose of different molecules. Focal adhesions are smaller in size and make junctions between cells and extracellular matrix by means of integrins, which are attached intracellularly to actin filaments. It is common to include gap junctions within the cell junctions group. Gap junctions are molecular channels located in the plasma membrane that allow the direct communication between the cytoplasm of adjoining cells. Every channel, known as connexon, is made up of 6 connexins, and makes possible the diffusion of small molecules between both cytoplasms. That is why gap junctions should be regarded as cell-cell communication molecular complexes instead of involved in cell-cell adhesion.